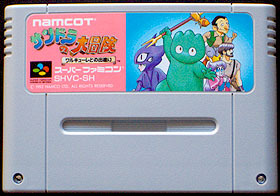 Sandora no Daibōken is a side-scrolling action game by Namco. Anyone already familiar with Namco's Valkyrie series will instantly recognize the cute and green character featured in the game - he is Sandora (aka Whirlo), Valkyrie's loyal friend. The game actually chronologically takes place right before Valkyrie no Bōken and starts in Sandland, Sandora's home village. Everything was peaceful and quiet until the day when a nearby volcano erupted. A rain of ashes covered the village and turned its inhabitants into stone statues. Then a deadly plague started to spread and affected Sandora's baby son. All of this was in reality the result of a curse laid by the evil sorcerer Zouna (aka the Malix witch in the European version) and Sandora embarks on a long journey to find a cure to save his son and the village. Our hero comes equipped with a large pitchfork that he can use to defeat Zouna's minions. Another special fighting technique allows him to charge-up his fist in the air and to fly across the screen, slashing anything on his way. He can also use three kind of jumps : regular jump, super jump (needs to be charged up for a few seconds) and a fast forward jump (triggered by pressing jump twice very quickly). However, Sandora must not overuse these jumps or he will get dizzy and thus become extremely vulnerable to enemy attacks. 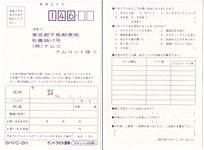 A password system allows the player to save his progress. 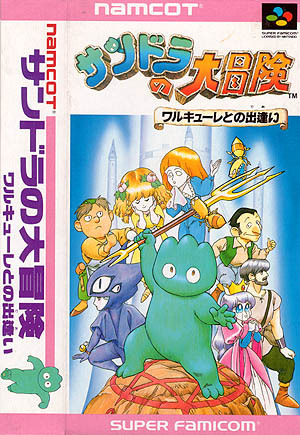 Sandora no Daibōken was released in Europe under the name Whirlo. 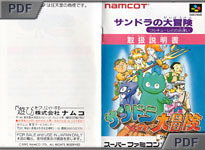 Curiously, most of the character names (and sometimes genders) were changed - Sandora became Whirlo, the evil sorcerer Zouna was changed into a witch named Malix and the girl Sabīnu (aka Sabine) from the Quarkman clan was changed into a boy named Steven... also, Namco changed some of Sandora's graphics and lowered his eyebrows, giving him a sort of "angry look" (picture on the right). The game never saw a release in North America and the European version is rare and sought after by collectors and can fetch $250+. See Valkyrie No Bōken: Toki no Kagi Densetsu (Famicom) for more information about the Valkyrie game series. Notice that charged-up high jumps are stronger while running. The game counts many (simple) puzzles. Do not hesitate to use all of your attack techniques to resolve them. For instance, the spinning attack will help you flying through the ice-walls from the first stage. Or to get up the big tree with the rope at the end of the forest. Sandora no Daibōken is a very enjoyable platform/action game. The life system is definitively the only major flaw in the game - there is no life bar, your character dies in one hit! And when he does, you are transported back to the beginning of the stage. Nasty. Then Sandora's various jumps can be tricky to use at times. However, Sandora no Daibōken is a delightful game with a gripping storyline with innumerable twists and character revelations. Graphics are simple but rich, colorful and sprites are beautifully animated. The soundtrack is also very well done and some of you will certainly recognize various themes from Valkyrie No Densetsu. Another great feature are the choices given throughout the game, and the multiple endings. All in all, Sandora no Daibōken is definitively a difficult game, but it has surprising depth despite the relatively simple gameplay mechanics.